Personal and business cards come with most of our accounts. Ask for a card at any branch. Your card can be printed while you wait, or we’ll mail it that day. Notify us right away. During normal business hours, call your local branch. After hours call (800) 791-2525. Always monitor your account activity through monthly statements, online banking, or 24hr Telephone banker. Report fraudulent activity to your branch. What if My Card’s Blocked or Closed? Our Fraud Analysts will contact you. If we can’t get hold of you, your card could be blocked or closed for your protection. Notify us if you change your phone number or address. If it’s after hours, call us at (866) 842-5208. When you travel, let us know what cities, states, or countries you’ll be traveling to. That way, your card’s always available for purchases no matter where you go. Credit or Debit? The Difference? The card works just like a check, but better. Make a transaction. It’s automatically deducted from your checking account. Your card’s more convenient. More secure. And, you can leave your checkbook at home. 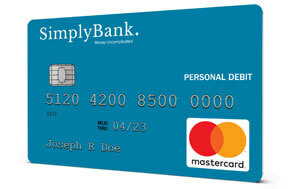 Your debit card is ready when you are. We offer many layers of fraud prevention, detection and protection every time you make a transaction. Click HERE for more information.